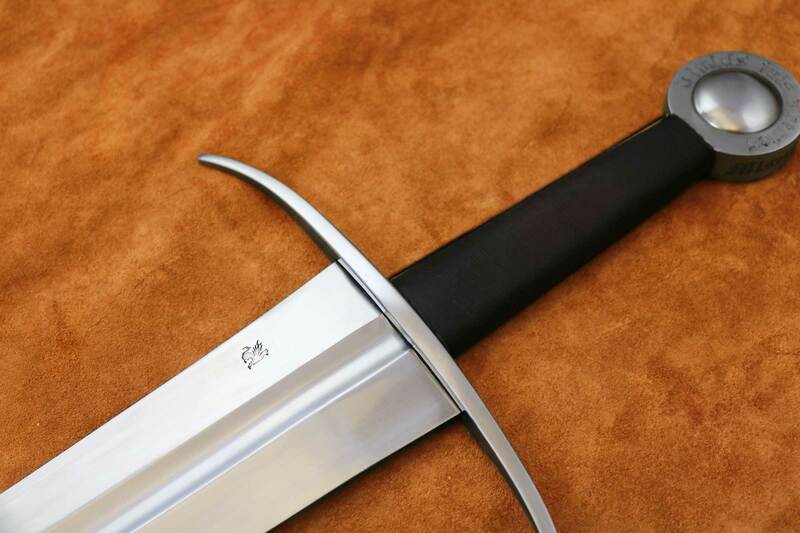 This classic 14th Century Medieval Sword has been reinterpreted many times in the modern world. This design is based on a knightly Medieval sword of type XVI classification, with some unique features. 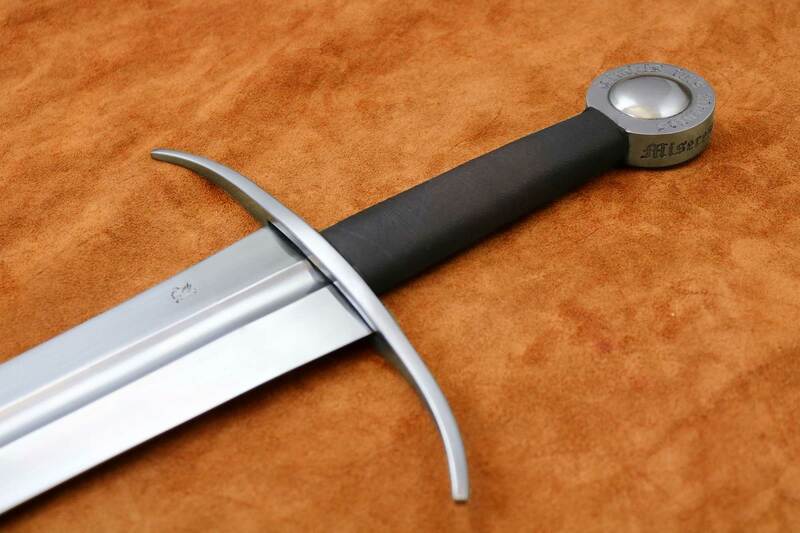 This classic 14th Century Medieval Sword has been reinterpreted many times in the modern world. This design is based on a knightly Medieval sword of type XVI classification, with some unique features. This type was developed as a response to the plate-reinforced mail armour of the early 14th century. 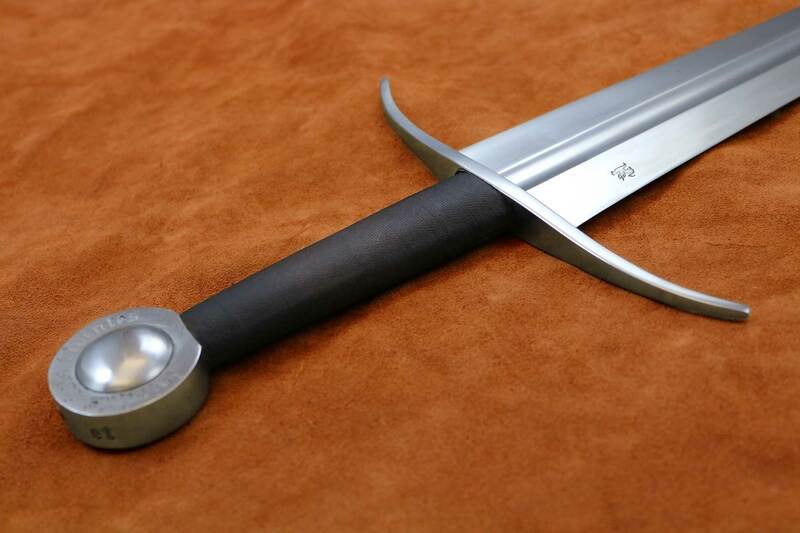 With a strong tapering blade, broad upper half and acute point, not only did this Medieval Sword deliver devastating cuts, but the sharp tip made this the quintessential thrusting weapon. The most striking thing about these blades is that they seem very clearly to be made to serve the dual purpose of cutting and thrusting while the point is acute enough even to penetrate plate armour, there was enough width and edge at the ‘center of percussion’ or ‘optimal striking point’ to enable the blade to strike a very powerful sheating blow**. – Ewart Oakeshott “The Sword in the Age of Chivalry. P, 61. 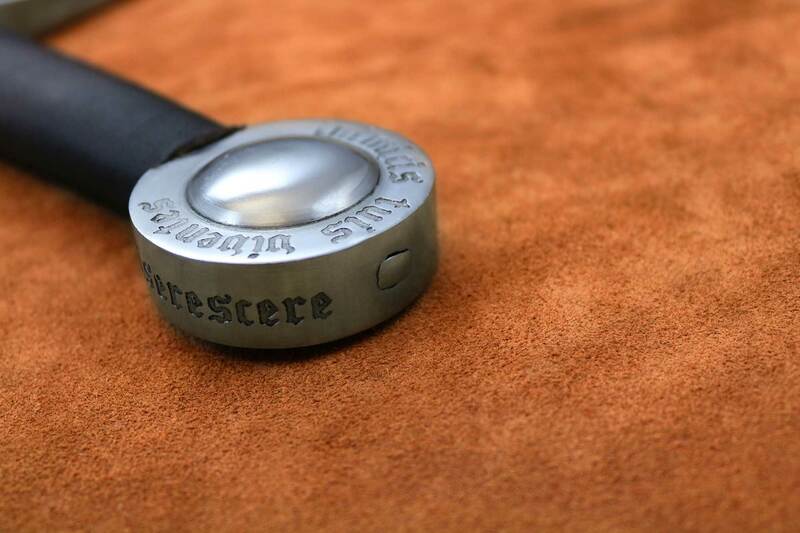 In addition to the classic fullered blade and relatively plain curved guard, this 14th Century Medieval sword has an interesting inscription on the pommel. 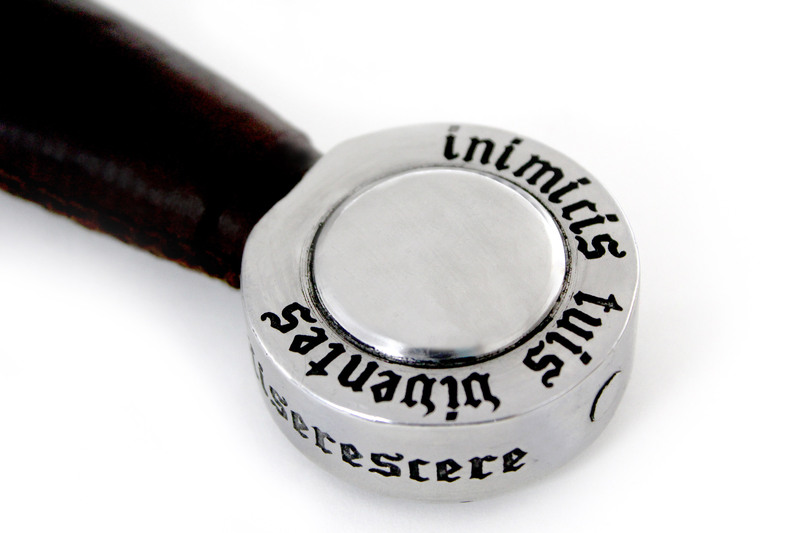 The Latin text reads, “Mai vos ostendo bonitatis, sinceritatis et clementia ad vestri inimicatus et omne vivum entis.” Translated, it says, “May you show honor, integrity and compassion to your enemies and all living things.” A truly chivalrous ideal for a knight to live up to, and a stirring reminder for us in modern times. I’ve read all of the complaints about DSA and decided to take a gamble with this company. 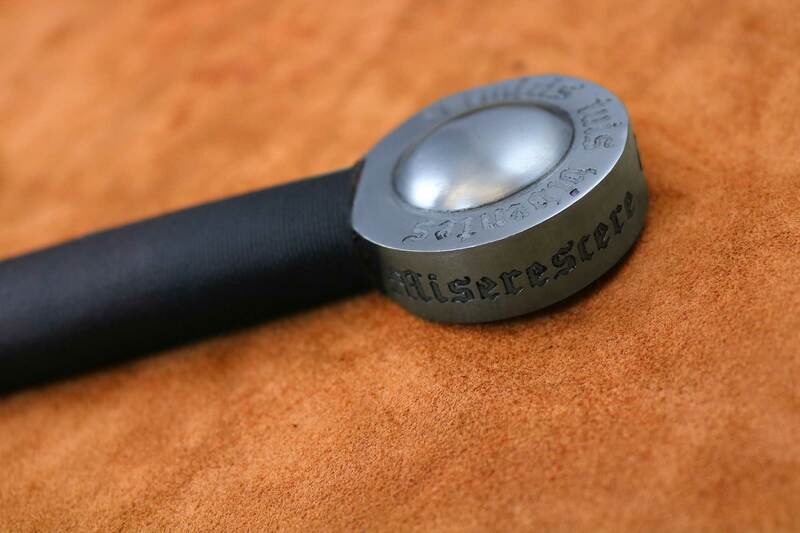 I ordered the sword with an interlaced scabbard and with sharpening service. I had low expectations and what showed up blew me away. 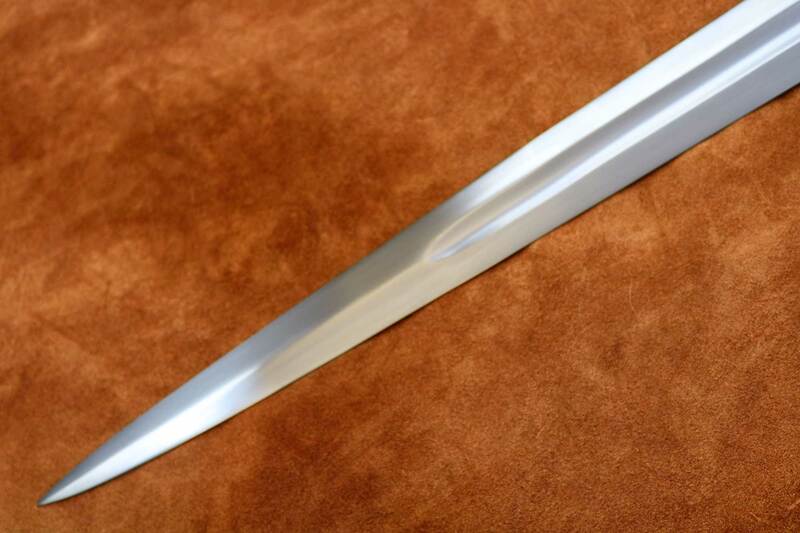 The sword came in very sharp with a clean secondary bevel. 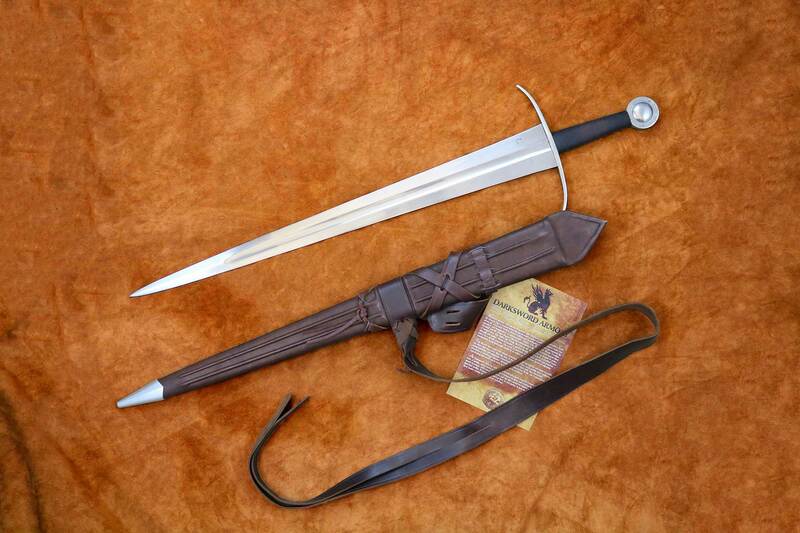 The scabbard is nicely done. I had to cut some of the leather for it to fit my waist because it was way too long to the point where I don’t think it would have fit on anyone unless your overweight. 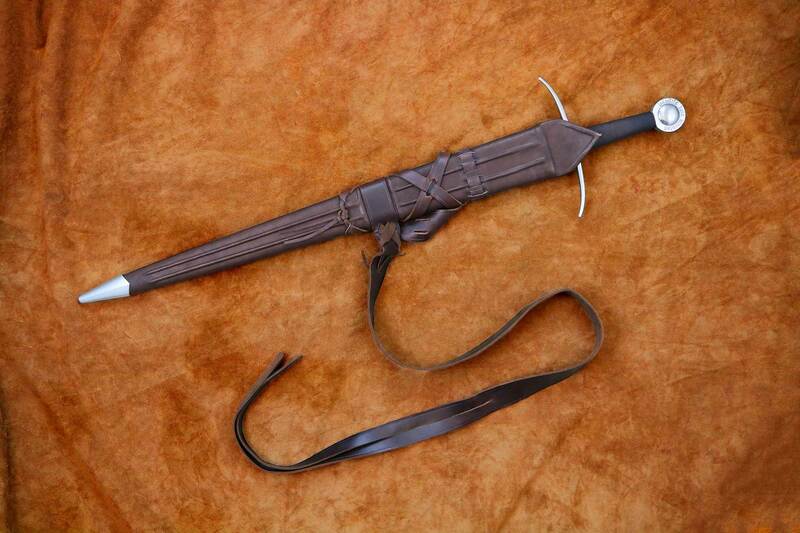 The sword sits in nicely in the scabbard and holds it tight enough where if you were to hold it upside down the sword wont fall out. Only two minor things I do not like. First is the gap between the guard and the blade. With the mirror polish finish it made the gap appear bigger than it is. And the last is the handle of the sword. The leather material is fine but it’s size of the handle. It’s a bit too long and skinny for my taste. I found myself re-adjusting my hand to get a proper edge alignment after repeated cuts due to how skinny the handle is. Sharpening service is nice. Cuts through waterbottles, twigs and cardboard just fine.